From award-winning author Anna Castle, the second adventure in the series hailed as “A must for Sherlock enthusiasts” by Midwest Book Reviews. I have read the first 2 books in the series & am looking forward to reading more. The characters are definitely memorable, as Holmes, Watson, and Moriarty are obviously spun from Sir Arthur Conandoyle's wonderful works; they are definitely not in the same relationship! This adventure brings the Moriartys into the dangerous world of murdering doctors. While in a private hospital, Angelina Moriarty looks to save her sister whom Angelina believes has been targeted for murder. As Moriarty, Holmes, and Watson look for clues outside the hospital to catch the murderers, Angelina is being drugged & mistreated. Viola, the sister, is now the one who is protecting evidence of the crimes & her sister! Recommended for those who are fans of Sherlock Holmes. I really liked this book. It had more action in it and lots of twists and turns. In this series, Sherlock Holmes is so obnoxious I really, really don't like him at all. In this book, we find out just how much Moriarty loves his wife. At times, I actually felt sorry for his predicament. There were some close calls which made the book that much more enjoyable. I really like this series. 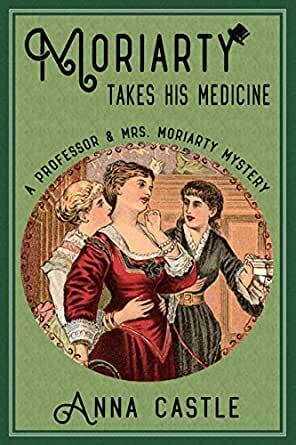 I almost stopped partway through – too many themes: the medical situations of many women; the marital problems of many men; the domestic disagreements of the Moriartys; the rivalry between Moriarty and Holmes …. I did finish it and found it interesting, but I have no desire to reread it. In fact, the domestic disputes were never resolved. I'm a big Sherlock Holmes fans and now I'm a Moriarty and Mrs. Moriarty fan. I thoroughly enjoyed reading this book the storyline was great. I was so engrossed I read it all the same day. I just loved it I am looking forward to reading the other books. Fast moving with fascinating twists and turns. Despite its setting in time it portrayed men and women as equivalent partners. Although some words were omitted, the story had me in its grasp. Well done!